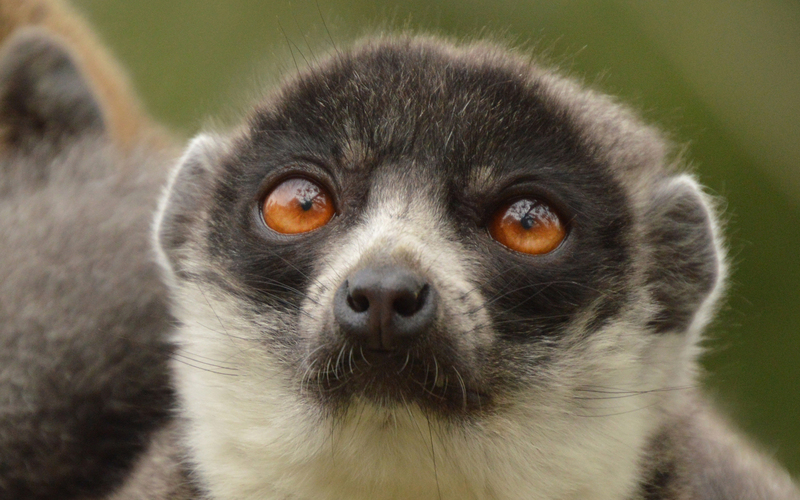 Mongoose lemurs have soft grey-brown fur with a pale grey muzzle and a black nose. They are about 30 cm long, with a 45 cm tail. The female weighs about 1.3kg, while the male weighs roughly 1.7kg. This species of lemur are unusual in that their daily activity and sleeping patterns change depending on the season. In the wet season, they are more active in the day whereas in the hotter dry season they are more active in the night. Similar to the Ring-tailed lemur the mongoose lemur’s diet in the wild is mostly made up of fruit, although they do eat flowers, leaves and nectar. They have also been known for feeding on grubs and beetles. However, due to the high sugar content of fruit found here in Europe, we are not feeding our lemurs any fruit and lots of zoos are now actively cutting out fruit from primate diets, as it has been directly linked to diabetes in these animals. The mongoose lemur lives in dry deciduous forests on the island of Madagascar as well as in the humid forests on the islands of the Comoros. Mongoose Lemurs are classified as critically endangered and their greatest threats are habitat destruction and hunting. Their habitats are destroyed for various reasons including slash-and-burn agriculture, charcoal production and clearing for cattle. You can learn more about the mongoose lemurs' conservation status on the IUCN Red List of Threatened Species website.